BHOLA: Awami League Presidium Member Tofail Ahmed on Thursday said the people of the country have turned away from the BNP for its wrong politics and this will lead to the party’s extinction, reports BSS. “BNP planned to rig the general election in 2006 that led to 1/11 in the country. It bagged 28 seats in 2008 general election and six seats in the December 30 (2018) polls. BNP will be like the Muslim League, Bhashani NAP and other extinct political parties in the next five years,” he said. 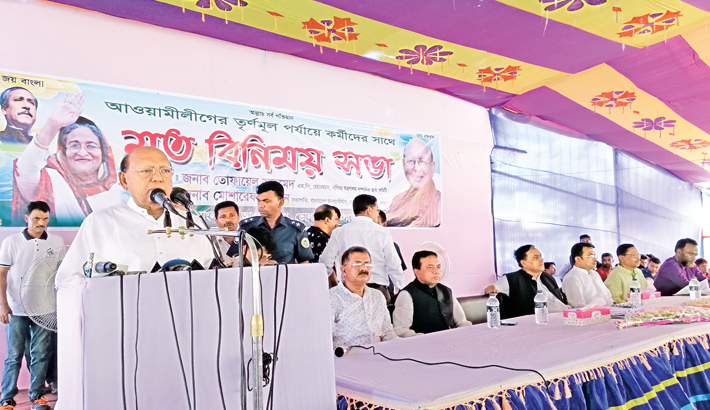 Tofail, a former minister, came up with the remarks at a view exchange meeting with grassroots activists of Awami League (AL) at a government school field in the town. Bhola sadar upazila AL president and upazila parishad chairman Md Mosharraf Hossain presided over the meeting addressed by, among others, Bhola district AL general secretary and district council chairman Abdul Mumin Tulu, upazila AL general secretary Islam Golder and upazila parishad vice-chairman Md Younus. The people never cast their votes for such a party which sells nomination papers in exchange of money and chief of which party is in jail being convicted for corruption while acting chairman is a fugitive convict, Tofail said. Referring to extensive development activities carried out by the government of Prime Minister Sheikh Hasina, he said BNP’s conspiracy will bring no outcome as the daughter of Bangabandhu has emerged as one of the greatest leaders in the world. Under the present government, massive development took place in Bhola, AL leader said, adding river erosion has already been prevented and 95 per cent people are getting electricity facilities in the district. The present government will construct the long-cherished Bhola-Barishal bridge, Tofail added.